Core – Be clear about the mission with your business and pretend that you would start your business today using all amazing digital technology available – how would you do it? That’s how you digitalize your business model, and what start-ups do every day. This said, the point about being clear about your objectives is equally applicable to subparts of digitalization. Why do you want to have a new IT system? Why do you want to train people in social media? Why do you want to start with programmatic marketing? Being clear about why will help you do the right thing. Capability – Ensure you have and continuously build the right capabilities. You do this by creating a culture of curiosity in your company and complement it with a corporate and individual learning plans. Change – Ensure you always Optimize and Innovation across all areas of your business. Have a weekly optimization meeting with a small loop team to lead progress. Innovate by taking any big problem in your business, brainstorm radical solutions and add digital technology to see which ones you can make amazing. If you are a big company, break out a group of your best people with the brief to put you out of business using digital technology. As always, keep it simple, think BIG and have fun! To start of your digitalization journey, here are some self-assessment questions you can ask yourself. See them as deliberately thought-provoking, but also as very serious. For any question where you answer no, you have to ask yourself if that is truly what you believe is right for your business. Are you clear about your mission, i.e. what value you want to bring to people and the world? Would 10 random employees in your organization express the same mission? Can you explain to someone how data will have strengthened your competitive advantage in 2 years from now? Can you for each step in your value chain explain when it will be most impacted/disrupted by digital technology? Do you have a group of people with the brief to put you out of business? Do you automate your business faster than your competitors? How do you know? Can you track your entire business on your phone while on the loo streaming Game of Thrones? 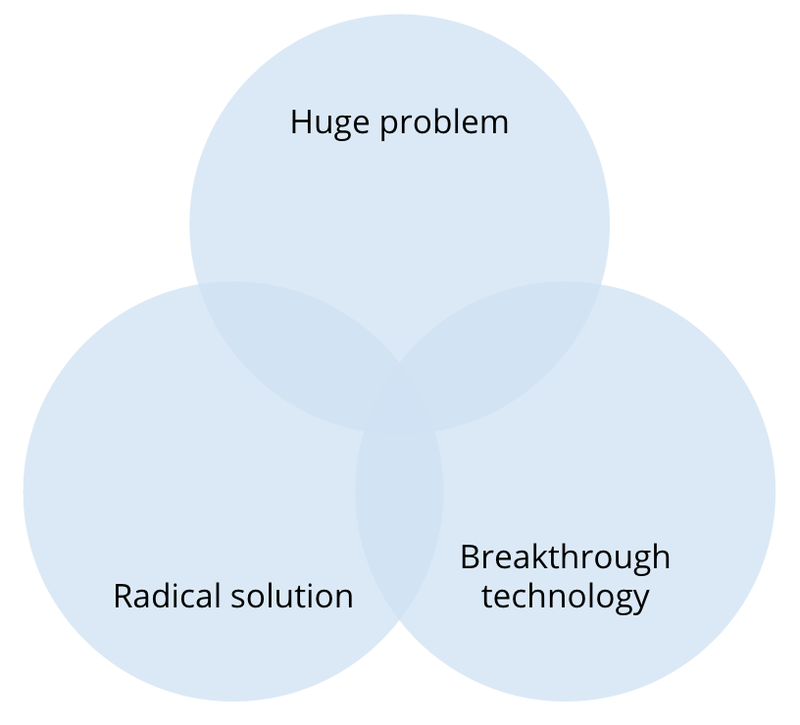 Do you have innovation prototype processes that goes from problem to prototype in max 1 day? Could you explain how you use machine learning in logistics, corporate finance and customer service? Do you have a digital content & service strategy complementing your core product? 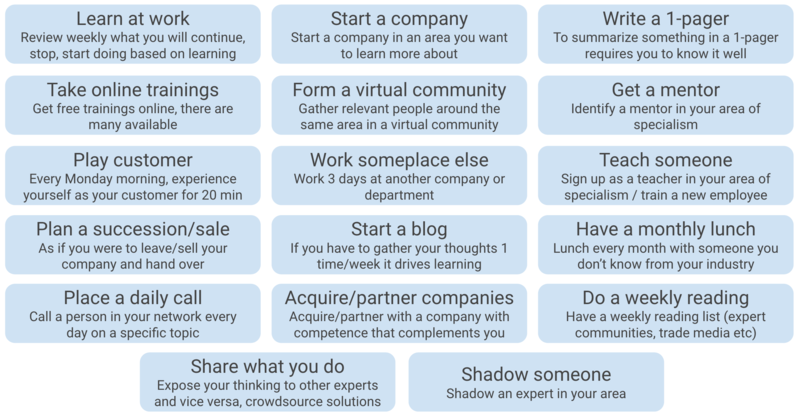 Do you know what you’re going to learn next week? Does everyone in your organization learn & develop faster than your competitors? How do you know? Do you have time scheduled in your calendar for innovation? Can you manage your work from home using only your phone for a month? Do you attach files to e-mails? Do you genuinely celebrate failure as an opportunity to learn in your organization? For example, do you promote people who succeeds with small expected things, or people who failed with a big bet but learned a lot? Do you adopt new technologies at work faster than at home? 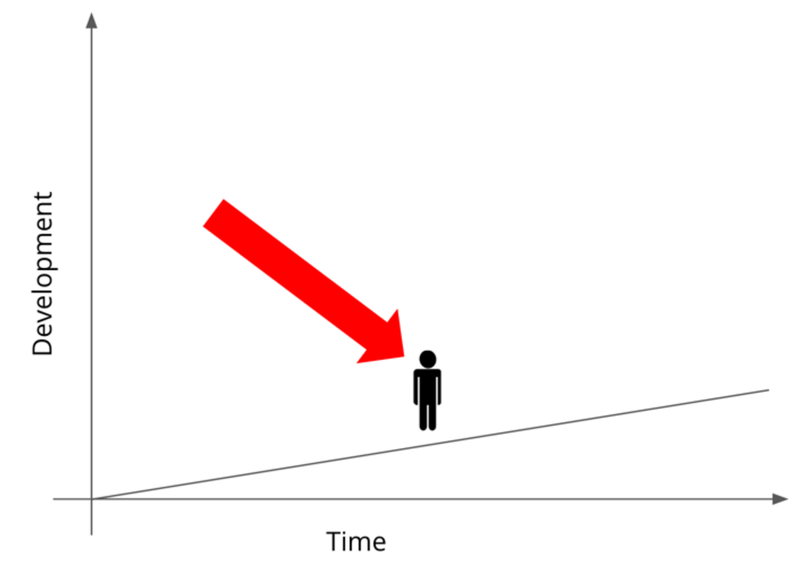 We as human beings struggle to relate to exponential change since we think about change as linear. 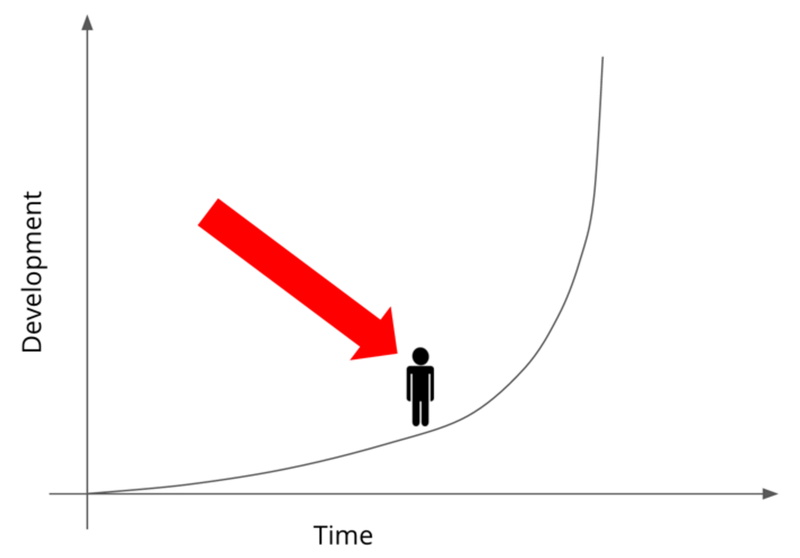 However, what the Law of accelerating returns that Ray Kurzweil have identified (link) shows, is that the pace of change is picking up, and that change is in fact exponential. The reason for this is rather straight-forward, which is that the more knowledge and development we have gained, the shorter period of time it will take to gain another equal amount of knowledge and development. This exponential development means that the change we experienced in the past 10,000 years we will experience in the coming 90 years, and the change we experienced in the past 20,000 years we will experience the coming 100 years. This puts us in a situation where it’s impossible to even imagine what the near future will look like. Something that can be both scary and exciting. If we believe that things change all the time, then learning things faster than competition is the only true long-term sustainable strategy and competitive advantage. Let this one sink in for a bit. One indication of the increasing speed of change is that the average age of the S&P500 companies have gone from 67 to 15 years since 1920. This means that with amazing learning, knowledge and insights you can build your business faster than ever before. What a great opportunity! One way of sense-checking what learning culture you have as an organization is to ask yourself the question what you are going to learn next week? If you have a learning culture than most people in your organization have a good understanding of that. If you don’t know what you and your organization are going to learn next week, it probably means you are leaving learning more to chance than to design. With learning being the only long-term sustainable competitive advantage that won’t cut it any more. Digital technology is today driving a lot of this exponential change, and by getting on the train sooner rather than later you have the chance to learn more things faster than competition, ultimately making digitalization a competitive advantage for you. Digitalization doesn’t have to be more difficult than this. With the three pillars of Core, Capability and Change, you can navigate any digitalization decision, discussion and debate – both overall for the company and for any sub-part. Before jumping into the details of Core, Capability and Change, a bit of context to get you up-to-speed about the digitalization discussion currently taking place. Some people start with the obvious equipment, stating that to digitalize a company you need to upgrade your IT systems and equipment to the latest and greatest digital technology in the hands of every employee. Others starts with capability, putting in place extensive training programs for everyone in the organization to learn how social media, machine learning and mobile solutions works. Some start with looking at what parts of the operations can be automated, a debate that tends to scare some people. In marketing & sales the conversations are often around programmatic technology and relevant CRM systems to ensure data becomes a competitive advantage over time. Independent of if you want to digitalize your entire business model or take a shot at a sub-area first, Core, Capability and Change will enable you to lead. What seems to be consistent across most consultancies in the area of digitalization is that they agree that being clear on your objective is very important before starting to change around things. In the case of digitalizing your business model, being clear about the very core mission of your business is very important. That said, it’s equally applicable to any digitalization effort. If you’re going to automate your corporate finance decision-making process, then being clear about the goal(s) of the corporate finance function is very important. If you want to give employees better tools for collaboration and cooler phones because that’s your idea about where to start the digitalization journey, then being clear about the objective is very important. So for any digitalization discussion, it’s no rocket-science, but you should always lead by investing a lot of time answering the question “What is the objective with this? For real?”. As long as you have defined a very clear answer to that question you’re in a very good starting position. The challenge is that sometimes people try to answer that question with multiple answer simply because they haven’t thought about it hard enough. Think about it, it’s worth the time. You can save a lot of money, time and headache by answering this properly. Now, it’s only natural that you get hooked up in your day-to-day business. It’s easy to mix up the mission for why we are in business with the solutions we deliver, i.e. not being able to separate the means from the end. In this case people get married to a product instead of taking a step back and figure out what the best way is to deliver on your mission using the digital technology at hand. This is an area that separates successful entrepreneurs from big companies. Many successful entrepreneurs comes into the market with a very clear mission about genuinely making something better for people, and if the offer is simple and great, with a much lower cost base vs the established giants, that industry is going to rapidly transform. 1) Define – Make the effort to really get under the skin of your company and define why you are in business. If a travel company is in the business to sell weekend and summer vacation packages to leisure travelers, that’s perhaps a bit too specific. Instead, consider a mission that is relax someplace else, or perhaps even get to know the world, or even inspire friendship and reduce fear. You can dwell as deep as you want into your Core as long as you land in something that everyone can stand behind, wake up in the morning and feel very excited about doing. The dwelling can be done by asking yourself the question why? a repeated number of times. This way you get the chance to get to the bottom of why you are in business. The trick is going to be to define your mission as something that genuinely makes life better for people and make it broad enough to encompass your future expansion wherever the digitalization journey takes you. Test the strength of your mission by asking people to come work for you at a bit lower salary vs competition but with this amazing mission. If they come your mission is meaningful. If the digitalization effort is not of the business model as a whole, then equally you should ask yourself Why? until you are all in agreement of why specifically you want to transform your IT systems, automate the supply chain, use programmatic technology or provide digital collaboration tools to all employees. It’s only by being very clear about what the meaningful objective is of any digitalization effort that you will be able to stay on course throughout the rollercoaster you are about to ride. Description: We love play! We want children to be able to just throw themselves into playing with their friends. We want parents to trust us with providing tools for children that are both safe and helps children develop as individuals. A digital playground – It’s a challenge to navigate the thousands and thousands of websites, apps and games for children online. As a parent you’re not sure what is good for your children, when they will get tricked with in-app purchases, and where they will go next. Play for life can be the first company making the effort to continuously aggregate the best resources out there into one website, so that you can feel safe that your children will only play with things online that are safe and that helps them grow as individuals instead of just biding time. Age-based filter for online store – If you enter the ages of your children you will only see things relevant to you. Challenge yourself on how you can document your objective in as clear and engaging way as possible. 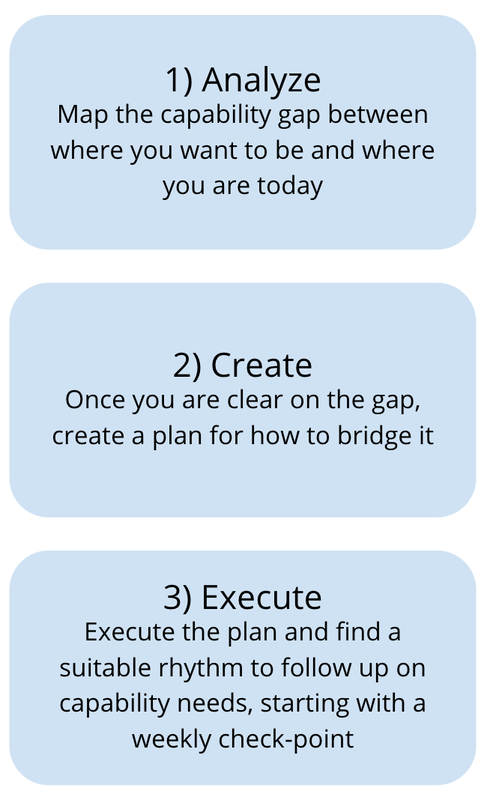 Enable all individuals to internalize it – Ensure that every individual with the help from their manager spends time thinking and talking about what the mission means for them. Celebrate it – Celebrate when people makes great steps in the direction of your mission. It can be failures leading to lots of learnings, or a product innovation, a service add-on or a way to talk to customers mirroring your mission. Celebrate what people do that is spot on your mission. Challenge people that are not working for your mission – If you have anyone in your organization that is passive towards your mission, inspire, engage and challenge them to take action. To sum up, you have to be clear about why you do something before you do it, otherwise you won’t know if you succeed or how successful you were. We know that you know this already, so it’s more about the discipline of always doing it. If you don’t know what benefits digital technology can bring to your business and how, you won’t be able to leverage these benefits. So if to digitalize anything, people need to be digitally savvy and continue learning new things. When thinking about “How to learn it”, it’s important to think creatively. As such, here are some learning modules for inspiration. Some of them might be more straight-forward while some are more time consuming. See this as a menu where any company, department and individual can pick what fits them best. We don’t want to get stuck with building capabilities and learning things just via traditional trainings or learning on the job without reflection. These modules helps you create an immersive learning experience. To sustain continuous capability-building, the best recipe is to foster a culture of curiosity. Think about your company and consider the people there. You can probably give us a list of names of people who are always actively seeking out to learn new things, who are not afraid to ask questions, who seems to have this endless appetite for learning new things. The people who are curious. You can make everyone in your company curious. That said, since people act as people around them you need to go all-in and truly make it the norm. A culture of curiosity will either be for everyone or remain to be the behavior of a handful of people running on their own fuel who are less influenced by peer pressure. Curiosity is a driver of action specifically linked to learning. George Loewenstein, a professor of economics and psychology at Carnegie Mellon University, has been summarizing some of the great findings about curiosity in his paper from 1994 called The Psychology of Curiosity. In this paper Professor Loewenstein states that: When attention becomes focused on a gap in one’s knowledge. Such information gaps produce the feeling of deprivation labeled curiosity. The curious individual is motivated to obtain the missing information to reduce or eliminate the feeling of deprivation. Time pressure – Which is why it’s important to continuously work on the long-term innovation and challenges of your industry instead of waiting until last minute. Look at banks for example, just wanting to get a mobile solution/bank out there, no matter what customer experience. Excess environmental noise – This is a tricky one since 90% of the data was produced in the last two years and we live in a world with a rapidly increasing amount of information. The resolution here is about simplifying what is around us, which is why it’s so important for companies to start with the objective and core of every area before rushing into details. One tool we will look at later in this chapter is the 1-pager, where you summarize an entire area in just one page. This will help reduce the environmental noise as it will give people in the organization a starting framework to then go deeper into what you find interesting. Ask questions – A powerful way of raising awareness of a gap in a person’s knowledge is by asking questions. Spend time really formulating interesting questions that points at things and bring in perspectives you didn’t have before in the organization. Also, it’s important that everyone signals that questions are much appreciated, especially questions pointing at old truths in the company or other sensitive topics. Scepticism to truths is a healthy driver of curiosity. Learning and development cannot afford questions that haven’t been asked. Infuse with bits of knowledge – We are not curious about things we don’t know anything about. Professor Loewenstein suggests in his paper that to create curiosity we can infuse people continuously with pieces of knowledge. Just imagine how this could be built into a company’s process by for example starting every day by simply sharing a fact about an area important to the company with all employees. Research in curiosity points to that curiosity increases with knowledge. The more you know the more you want to know. It really creates a positive spiral upwards. Don’t stress – Ensure we continuously work on the big rocks mid- to long-term instead of only chasing quarterly results. We need to deliver the quarter, but we also need the mid- to long-term expansive learning to be there. Simplify what is complex – Don’t talk about how big and complex things are. Reinforce the mission of your company and share the core of different areas influencing your organization. It’s very important that everyone in top-management actually do this. We don’t want any CFO or similar to sit there and say (or think) that they know what they need to do and that this whole curiosity & change thing isn’t for them. Everyone in top management needs to be in on it. Solomon Asch is a known psychologist that had people observe a line on a piece of paper. They were then asked to look at three other lines of similar length and judge which of these three lines that was closest to the line they just observed. The participants succeeded easily. In the next step Solomon brought in people that deliberately guessed on the wrong line. This resulted in that three quarters of the participants got so insecure that they several times picked the wrong line. Hence, the majority guessed wrong because of peer pressure. There are more similar studies that shows similar phenomenons, i.e. that our thoughts and actions are severely influenced by what other people around us thinks and do. So if you get enough people to become really curious, want to learn and want for their department to learn and innovate it will have a social impact. Once the majority of people, including management, start to develop curiosity and an appetite for learning it will become the norm and culture. This is why clusters such as Silicon Valley and the Stockholm startup scene works so well because it almost becomes expected from you to do something great and build a company. The most curious company I’ve come across is the fashion start-up company Ivy Revel. They have truly been able to create a learning culture, and even put a word on it: Pace. They always talk about the pace of learning and how it can remain fast. Their owners lead by example by meeting with people they don’t know just to learn new things, by admitting openly when they don’t get things, and by making testing-and-learning an expected part of everyone’s job. They don’t take anything for granted but always looks at things with a no limits mindset. They are curious and plan to do everything they can to stay that way. Pace. This is something you have to do across all areas of your business. If simplifying you can divide your business into Strategy and Operations on the one hand, and Organization and Products & Services on the other. To this you can then apply your broad capability of digital technology, and specific practices as outlined in the figure below. So for example, what role could Automation play in Organization/Operations? Something linked to how you scan the web for potential candidates to come work for you? How you carry out performance reviews? There are thousands of things you can do by merging digitalization practices with your strategy and operations. 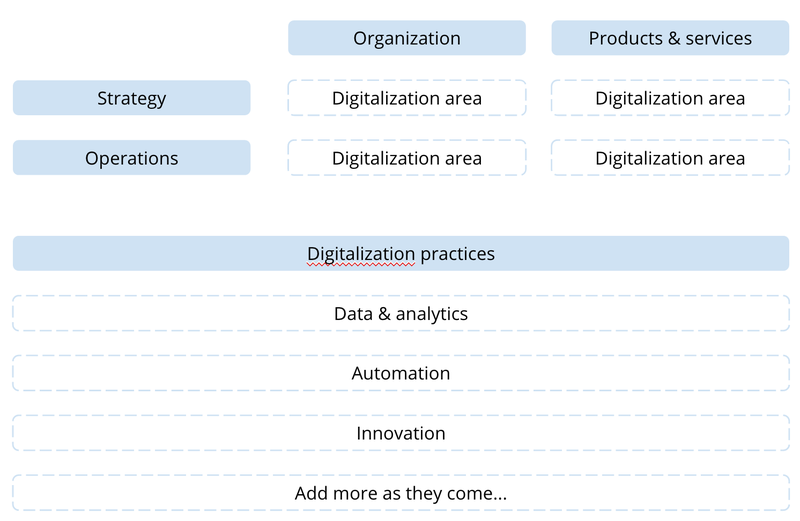 For every one of the four digitalization areas outlined in the figure above you need to both optimize day-to-day the role digital plays in that area as well as innovate how to transform that area and take it to the next level using digital technology. There is much to write about optimization and innovation and we won’t cover it fully here. On optimization a great starting point is a weekly optimization meeting with a loop team consisting of your internal digital people and external stakeholders. In the area of innovation I want to share one thing as a food for thought to all big organizations reading this. For many big organizations, creating something truly transformational is almost impossible within existing structures with KPIs, performance evaluations, managing short-term business with long-term planning and the expectations of how to do things. Therefore, one very real option for all major organizations is to break out a group of people with the brief of competing with the main business using digital technology. Having this freedom will enable them to do extraordinary things. There are more and more examples of companies that do this, where one of the pioneers was Google with Google X. Founded in 2010 as a division of Google Inc, it is now called just “X” and operates as a subsidiary of Alphabet Inc. At X, they take a huge problem, come up with an almost science fiction level of solution, and then add a breakthrough technology to see if the science fiction solution actually could become reality. Any company could use this framework when innovating around digitalization. Take any big challenge in the company, brainstorm radical solutions that would seem impossible, and then add digital technology to see if any solution becomes within arms reach. MTGx is the digital accelerator of Modern Times Group, and is focused on leveraging MTG’s digital assets and industry leading content portfolio, to create and deliver world class entertainment experiences. MTGx is committed to increasing the development speed of MTG’s digital entertainment services across the world, and provides centralised digital skills and platforms to all of MTG’s businesses. MTGx also works closely with innovation and startup communities around the world to find and develop the entertainment services and products that will drive entertainment in the future. MTG X is a great example of when someone tries to break out part of the business to act as a sparring partner to the main business. Ask yourself the question: Who would you rather see win – a competitor you own or a competitor you don’t own? Action point: Optimize by scheduling a weekly optimization meeting with a small loop-team of stakeholders, and innovate by taking any problem, brainstorm solutions and add digital technology to ensure the solutions becomes reality. Do this across Strategy and Operations for both the Organization and Products & Services. Digitalization has happened when digital technology is ingrained in everything you do without people reflecting upon it as something digital. It’s just reality.